A popular cryptocurrency and decentralized remittance system, Ripple has shown a radical incline in terms of prices. As per the reports of Cointelegraph, the latter experienced an unprecedented growth in price of more than 100% last week. 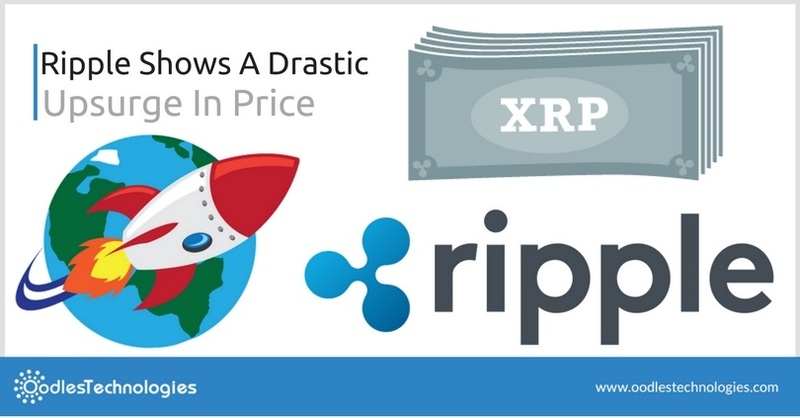 With this sudden shake up in prices, Ripple has topped the charts surpassing Dash and becoming the third most valuable Cryptocurrency as of today. The current XRP value of Ripple is $0.03956 (at the time of writing) while the total market cap adds up to $1.41 bn which is even greater than that of Litecoin. Last Friday, the XRP price rose up to $0.0556 which is an all time high for this semi-decentralized payments network. The reasons behind this sudden price growth are still unknown. However, many people are connecting it with the association of Bank of Tokyo-Mitsubishi UFJ with its Global Payments Steering Group. The group boasts an active partnership from several leading financial organizations such as Bank of America Merrill Lynch, Standard Chartered and Santander. The group is striving to promote Ripple’s eponymous payments network on a global scale. The Ripple price appreciates amid the collaboration of the Global Payments Steering Group with Bank of Tokyo-Mitsubishi UFJ which happens to be the largest bank in all of Japan. Many people are concerned that since both the events have taken place simultaneously, there can definitely be some close connection between the two. Although this kind of price fluctuations are quite common in Cryptocurrency landscape, Ripple hadn’t experienced a major incline in the last two years. So this has definitely spread a tide of joy among the Ripple token holders. You may also like Dash May Become The Second Cryptocurrency To Have A Debit Card. Dash had been enjoying a steady uprise earlier this year. Not long ago, it was ranked as the third most valuable Cryptocurrency after Bitcoin and Ether. The price of Dash also touched the $100 mark few days back which was an all time high but then it started depreciating. For instance, the Dash price was recorded $105 on March 20 which has been reduced to just $67 with a percentage decline of more than 40%. The main reason for this severe decline is said to be the ongoing upgradation of Dash servers. The Dash team reveals that a team of developers from Jaxx are working on the forthcoming update of Dash and all the Dash servers are being upgraded. This update was necessary since the previous system was unable to scale the increased number of users and transactions going on in the network. The direct impact of this update seems to be on the price value of Dash which continues to decline. The position of Dash in the top ten charts has also been degraded in the aftermath. The Altcoin used to be the third most popular Cryptocurrency few days back and now it has moved on to the fifth position. However, the Dash team reports in a tweet that the upgrade is almost complete with 99% uptime.